What Else Should Kawasaki Put Its 300-HP Supercharged Liter Engine In? After downing a few Dixie cups of bourbon with somebody close to Kawasaki at last night's Jalopnik Film Festival, I may or may not have heard "oh yeah, that supercharged bike engine will end up in an ATV." 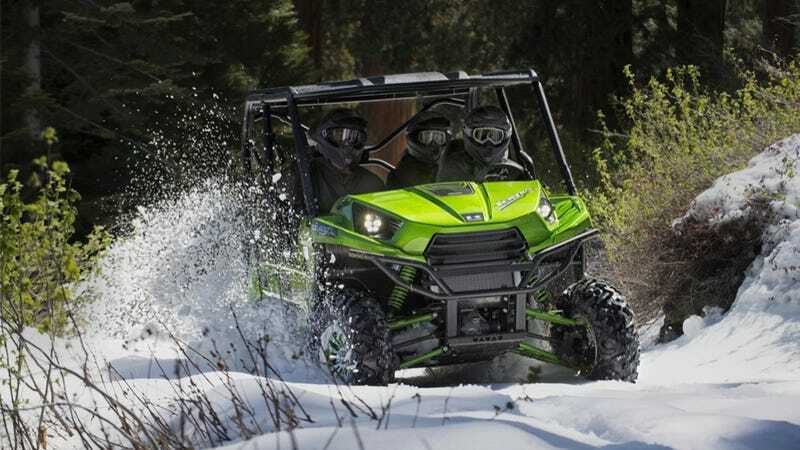 Kawasaki's current range-topping Side-By-Side ATV is the 783cc Teryx, which makes something like 50 horsepower. Even the de-tuned street version of Kawi's new 998cc supercharged bike motor would still blow the doors off anything on the ATV market right now, and I've heard from a few folks now that the "paltry" 200 horsepower H2 will be dialed up significantly with a more aggressive cam and new fuel map. Think 300 horsepower in a jacked-up farm buggy is a good idea, or a great one? What else would you want to see this monster motor in?